Vision is what makes your photo great. And composition as well. Do not underestimate them. The basis, however, always remains the properly captured photograph. In the classic static photography the camera will do everything instead of you. Regarding to Long Exposure Photography, you must tell your camera how long the shutter shall remain open for the correctly exposed photograph. The camera must be set to full manual mode. Therefore, we now tell how to calculate the exposure time in Long Exposure Photography in a few easy steps. Find a suitable composition, put your camera on a tripod, fix cable release to the camera. Set the camera to aperture priority mode („A“ on Nikon and „Av“ on Canon). Focus and select the required aperture. The most ideal aperture for most lenses is between f/8 and f/11. 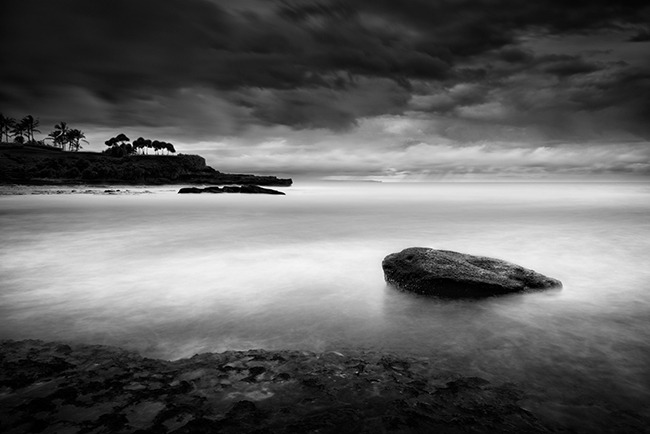 Since mostly for long exposure photography are used wide angle lens, it is not a problem even for aperture f/6.3. From my experience all will be sufficiently sharp. Do not exceed the upper limit f/16, try to keep it in an ideal values. The reason why not to go above is diffraction by which the lens suffers and in the photograph you can see all the dust on your ND filter. You will save the time to remove them in photoshop. Nikon D800, Nikon 16-35, f/14, ISO 200, 24mm, 30sec. If you want to see the structure of the water surface, use the exposure time of 30sec. We have the camera on tripod, we have set the ideal value of aperture on f/11, the camera is set to aperture priority mode. Pressing the shutter we have the following values calculated by the camera: ISO 200, f/11, 1/500sec. Now we will show the example of how to achieve at these values the exposure time for example 4 minutes. As I wrote, I use two filters stacked one on another, they stopes the exposure time together for 16 stops. When you look at the lef column in the table you will find a value of 16 (density of used ND filters) and then look in the same line value of 4 minutes. The table will show you that the time you set (1/500sec.) is not correct. The correct should be (1/250sec). You are still at aperture priority mode so increase the aperture „f“ above until the camera shows the value of 1/250sec. 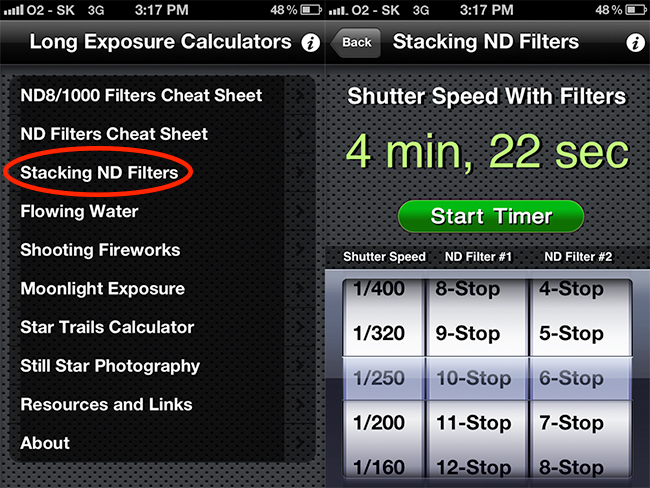 How to calculate the exposure time using the Iphone app. The second simplier option how to calculate the exposure time is to use an application for example on the Iphone. Click on this link if you want to download this app. After its launch in the first menu click on „Stacking ND Filters“. In our case, we set the value of 1/250sec., the first filter 10-stop and the second filter 6-stop. The application will instantly calculate that the correct exposure time is 4minutes and 22seconds! Isn´t it great? Once we know what values we need, we set the camera to full manual mode. Value of the exposure time is set to „bulb“. Shutter will stay open as long as you need. Cover your viewfinder so that light would not trap through it on the camera sensor at long exposure, attach filters and finally take the shot! Control the histogram for each photo to avoid completely dark and completely bright areas in the photograph. You may lose the drawing in some parts of the photograph what we definitely do not want. Often applies that although you correctly calculate the exposure time, we still need to add 20­% of extra time. This will show you most reliably the histogram. Nikon D800, Nikon 16-35, f/5.6, ISO 100, 19mm, 149sec. If you prefer more ethereal look, set the exposure time for 2 or more minutes. Learning to technically manage how to calculate the exposure time is of course the basis of how to get to the photo itself. Equally important is your vision of how the final photograph should look. 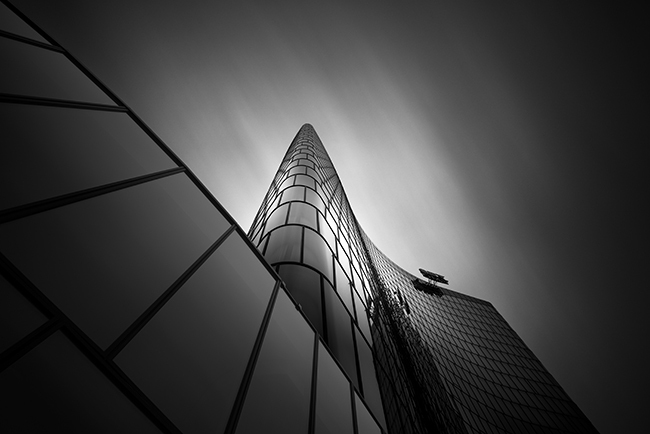 In Long Exposure Photography there is no rule which the photographer must strictly follow. Experimentation is definitely the way you must take. On the LCD screen of the camera you can not actually see whether the desired outcome is successful. My final tip for you is therefore as follows. Always do the different variants from each picture, I am doing 30 seconds, 1 minute, 2 minutes, 4 minutes, sometimes going even further but it depends on the conditions. Subsequently I select only one at home which I like the most. Did you like this article How to calculate the exposure time? Subscribe to newsletter and share it on social media. If you have a question, do not hesitate to write me. Thanks for the article Matej. I am shooting with a D90, and was wondering whether you recommend using the in-camera long exposure noise reduction, or doing noise reduction in post-processing? Hi Stephen, you are welcome! I do not recommend to use the in-camera long exposure noise reduction. I use Nik Software Dfine 2.